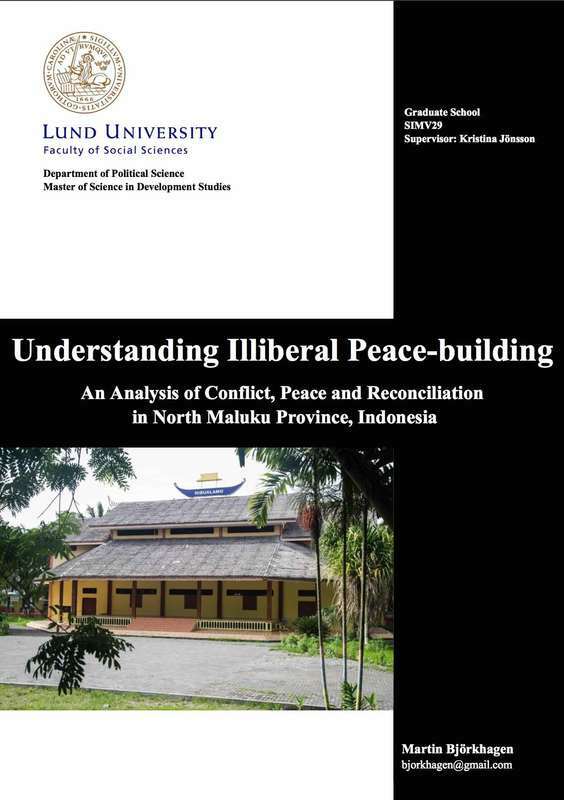 The main research problem in this thesis is the lack of a holistic understanding of how neo-patrimonialism, colonial legacies, decentralisation, illiberal peacebuilding and the revitalisation of traditional reconciliation practices have affected conflict, peace and development in North Maluku Province (NMP). This is important to study given the negative impacts inherent in the conflict-development nexus. In order to help bridge that research gap, the above stated processes have been conceptualised in a framework, which is incorporated in a qualitative case study design. In-depth interviews and the Reality Check Approach (RCA) are the main data-collection methods used to explore the research problem. The most significant findings are that the illiberal peace-building approach, coupled with a revitalisation of traditional adat practices, have been the key to the successful realisation of peaceful coexistence between Christians and Muslims in NMP, which suffered from a devastating communal war in 1999 and 2000. ​​This article examines how adat culture influenced peace-building and reconciliation efforts in North Maluku Province (NMP), Indonesia. This province was plagued by communal conflict from 1999 to 2000 following the fall of President Suharto’s regime. Nonetheless, NMP stands out as a rare success story for its comparatively quick consolidation of peace and its bottom–up efforts to reconcile the community, which was divided along ethno-religious lines. In-depth interviews were conducted with local elite and expert actors, and the Reality Check Approach (RCA) was used to explore the emic perspective of villagers at the grassroots level. An important key to the successful peace-building was that both the elite actors in regency government and most people at the grassroots level were united in their efforts to use a reinvigorated adat culture to reconcile the communities. In addition, minority groups and migrants were largely included and standard top-down attempts at reconciliation were absent, as most international organisations also promoted the local initiatives. The level of reconciliation does not, however, extend further than peaceful coexistence, partly because issues of culpability remain taboo in NMP. To achieve thorough reconciliation, the former conflicting parties would need to assume responsibility for wrongdoing and follow it up with forgiveness.